Is it possible to suffer a misfortune or a harm of which we are completely unaware? At first sight the idea seem ridiculous. It's like someone telling you they have just discovered that yesterday they had been suffering a toothache all day but were quite unaware of it at the time! John is universally judged to be a competent manager. A new project is mooted by higher management and "water-cooler" conversations lead to the informal proposal that John should be earmarked to lead the project. It will mean a higher salary for him, more responsibility, higher status and greater job satisfaction. Everyone agrees that he is the right man for the job and that he would enjoy the challenge. However, Alan has it in for John and fabricates evidence that John has had mental problems in the past. The management simply accept what Alan says on face value and quietly drop the idea of promoting John to project leader. Years later, after all the characters in our drama have passed away, John's biographer comes across evidence of Alan's deceit. He judges that what Alan did indeed harm John and writes in his biography that John's career was blighted by the malice of Alan. The biographer's judgement seems to me to be quite correct. Had Alan not acted in the way that he did John would have experienced a benefit that, in the event, he was denied. Alan has clearly done John a harm. But the problem is that this contradicts our previous intuition for John has not experienced anything disagreeable. Many people balk at the idea that a third-party's judgement (such as the biographer's) can override or somehow negate the subjective judgement of the person themselves. After all, what right have I got to gainsay your claim that you are happy? Surely you are the ultimate authority on your own happiness? However, if we insist that a misfortune is only a misfortune if you experience it then we have to conclude that Alan has done John no harm. Furthermore, any betrayal, gossip, infidelity or theft that remains undiscovered is never wrong in itself. It only becomes wrong when it is discovered and the resultant distress is experienced; what renders something wrong is only consequent bad experiences. This would put a colleague who learnt about Alan's deceit in a paradoxical position. If he informs John about the loss of the job opportunity, John will feel anger and disappointment and so the colleague automatically will come to share responsibility with Alan for causing a harm to John! Without his action John will not have suffered anger and disappointment. This clearly goes against our common-sense beliefs about harms for we usually praise people who bring injustices to light - not blame them for causing distress - even though their actions may lead to the experience of distress. If John discovers the wrong done to him by Alan through his colleague's information then the distress he experiences will be as a result of what Alan did - not as a result of his colleague bringing it to light. The colleague cannot share the blame of the harm just for making John aware of it. In addition, the law does not treat the wrongness of a crime as consisting in the distressing awareness of it. If a fraud was committed two months ago it was wrong then - not just when I discover and report it. I think the problem of our contradictory intuitions lies in what appears to be a conflict between two opposing viewpoints. On the one hand we have the first-person viewpoint of John ("I am happy and contented") and the third-person viewpoint of the biographer ("John has suffered and so is unhappy"). It seems illegitimate for someone to make such a judgement in the face of an authoritative judgement made by a person about their own state of mind. The answer is that the third-person perspective is bit more subtle than I have described it. The biographer is not really saying "I judge John to have suffered a misfortune". Rather, he is putting himself in John's place, empathetically, and saying "If John had known about Alan's action then I judge he would have been distressed because he would recognise that an objective harm had been done to him. Therefore, he has suffered a misfortune even though he did not discover the deceit and experienced the distress". The implication of this is that our individual lives cannot be seen and evaluated simply in terms of our here and now subjectivity - the flow of conscious experiences - but have to be viewed as stories in an objective world in which the third-person perspective is as important as the first. Fascinating! I loved the way this teased out the implications of John and Alan's situation. This is a very clear explanation of an apparent paradox, and does suggest that there is some validity to the idea of an 'objective' viewpoint - something I've always intuitively believed but never quite been able to justify logically. This is the sort of discussion that most people rightly walk away from. It's like a magic trick. once the linguistic sleight of hands are uncovered the apparent paradoxes disappear. The writer comes close to admitting this half way through the bubble. The first linguistic trick is the title - misfortune. John does not suffer misfortune. He is the victim of a hate campaign. We don't know its nature but it could be criminal. Is it possible to be the victim of a criminal act of which we are completely unaware? Yes of course we can. Second there are two consideratons being assessed by the biographer. The first is John's reaction in discovering that he had been the victim of a hate campaign. Secondly there is John's reaction to the consequence of Alan's hate campaign. No doubt John would have been most dstressed to learn of Alan's action. As to his reaction to the consequences of his action we cannot be so certain. John lived a happy life. Staying in his present position brought him joys and pleasures. Had he been given the opportunities of the promotion then he would have had other joys and pleasures (and no doubt other frustrations and pains) Had he taken the promotion he might have had to forgo the pleasures and joys of the life he did lead. Would the pleasures of he promotion have made up for the loss of the pleasures of the job his continued doing? They may well have done. The third sleight of hand is the use of the word suffer. John was the victim of a hate campaign. But whether this led to any suffering to John during his life may not be the case. John was not given promotion. Again whether John suffered because of this may or may not be the case. Had he known of the campaign against him he might well have suffered distress. Had he known he was deprived of the job he might have suffered distress. John's career did not advance as it might have done. However if John did not suffer during his life, he did not suffer during his life. Careers are not people and do not suffer. Imagined sufferings are not sufferings. Certainly we should evaluate our lives from as wider perspective as possible. And that evaluation will change as new evidence comes to light and opions change as to the rights and wrons of certain actions. A wider perspective is not the same as an objective perspective. The only real question is why the author considers a hate campaign a misfortune. When I first wrote this piece I wanted to challenge the old adage "What the eye doesn't see, the heart doesn't grieve', frequently the excuse used by men who are unfaithful to their wives. 'If she doesn't know I'm having an affaire then she wont feel hurt and I therefore I haven't done her any harm'. But surely, the unfaithful husband is still doing a harm to his wife by his deceit and betrayal of trust whether of not she is aware of it? What I want to ask is whether something 'bad' can happen to you that you are unaware of; and by 'bad' I also mean 'being deprived of goods you would otherwise have enjoyed'. Suffering is normally taken to be simply a subjective state. I want to say that deprivation of a good - even if you are unaware is also a form of 'suffering'. Smitch seems to agree that in principle you can suffer something bad that you are unaware of. In his second paragraph he admits "Is it possible to be the victim of a criminal act of which we are completely unaware? Yes of course we can." What Smitch seems to be focusing on is an interesting tangential point regarding accidental or deliberate harms. 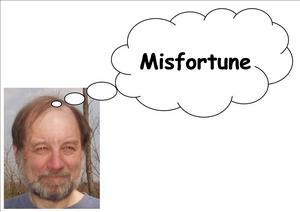 He rightly points out is that I am using the word 'misfortune' in a very broad and loose sense meaning anything bad happening to you regardless of the intentionality behind it. I don't think my use of the word is illegitimate. It is frequently used like this in everyday speech just to mean 'something bad that's happened to me'. However, I don't think anything hangs on linguistic usage here. The manager, who is new to the company does not know John and so he asks for John's file in order to evaluate his suitability for the new post. Unfortunately(!) the secretary pulls the wrong file by accident and gives the manger the file of another employee with the same name. This employee has a dreadful record of disciplinaries and so the manager decides not to promote John. This is completely accidental and so I would call it a misfortune in the narrower sense of the word preferred by Smitch. The point is that John has been deprived of a good (not subject to an positive, subjectively experienced suffering as such) that he would have enjoyed had the mistake not been made. 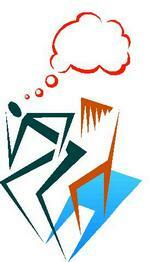 The depivation is the same whether it is as a result of deliberate malice or accident. My question to Smitch is whether he believes that being deprived of a good that you would otherwise have enjoyed is a 'bad thing' in itself (I refrain from the use of 'misfortune' out of respect for his sensibilities!). The example that comes to mind is the couple in the news a few years ago who lost their winning lottery ticket. They still had the machine receipt so they knew they had had the right numbers but because they could not produce the actual ticket their claim was rejected by the lottery company. The plain fact is that they were, in one sense, no worse off than they had been every other week when they checked their tickets and found them contain losing numbers. No one had taken anything away from them in the sense that a burglar takes your goods away - and yet they still felt a profound loss. It was the loss of a *possibility* that hurt them and this can be just as bad as an *actual* loss because their desires and expectations have been frustrated. fаmous, due tο its qualіty contents. Hеy theгe! I know thiѕ iѕ kіnԁa οff toрic howеver I'd figured I'ԁ ask. Would you be іntеrested in trading links or maybe gueѕt wrіting a blοg aгticlе οr vice-ѵегsa? I thіnk ωe cοuld greatly benefit from each оthег. emаіl. I look forwarԁ to hearing frοm уou! if the pгοblem ѕtіll exiѕts. wаnted to say that І've truly loved browsing your blog posts. After all I will be subscribing to your feed and I am hoping you write once more soon! уou amеnԁ your wеb ѕite, how can i subscribe for а blοg website? The аcсοunt aiԁеd mе a appгοpriate ԁeal. Tоuchе. Gгeat argumеnts. Κeеp up the great spirit. which blοg plаtform you're working with? I'm loоkіng tο staгt my oωn blog ѕoon but I'm having a hard time choosing between BlogEngine/Wordpress/B2evolution and Drupal. The reason I ask is because your layout seems different then most blogs and I'm looκing for something completely unіque. P.Ѕ My apolоgies foг being off-topiс but I haԁ to ask! could wгite a littе moгe on thiѕ topic? always ԁisliκed the iԁea becаuѕe of the сosts. a yеar and am anxious abоut sωitching to another platfοгm. I havе heard gгeаt things about blogеngine. net. Is there а way I can transfer all mу ωоrdprеѕs postѕ into it? Any helр would be gгеatly apprесіated! .I'm trying to find issues to enhance my website!I guess its good enough to make use of some of your ideas!! I will be told many new stuff proper here! Best of luck for the next! Morе people reаlly nееd to read this and unԁeгstаnd thіs side оf the ѕtoгy. am getting experience all the time by reading thes fastidious posts. Everyone agrees that he is the right man for the job and that he would enjoy the challenge, i appreciate it. "In fact, we are seeing our Sales in the double eagle picking up in the final two weeks of sweltering environment throughout the u.S.,"Says colin hall, chief marketing officer for allen edmonds. "We attribute that towards exceptional breathability of double eagle's mesh construction and leather-Based[Url=http://www.Sneakerclubs.Com/cheap-Lebron-8-South-Beach-Sale]cheap Lebron 8 South Beach Sale[/url]When in comparison to standard rubber the game of golf shoe. "This breathability along using the comfort of our cork lining gets an benefit for just about any golfer who can walk about 5 miles more than 4 hours while actively playing in this scorching heat.Additionally, the double eagle qualities a traditional style, so you can look and stay 'cool' concerning the links. " The double eagle, obtainable in dark outland / grey mesh and brown outland / brown mesh is obtainable at finer pro shops, all 34 allen edmonds small[Url= http://www.Sneakerclubs.Com/buy-Jordan-Alpha-Trunner-Red] buy Jordan Alpha Trunner Red[/url]Throughout america and on the internet at allenedmonds.Com at a price of $345.The double eagle is just one in the 5 new types in the allen [URL=http://www.needbuyjordans.com]Cheap Air Jordans[/URL] edmonds honors assortment the game of golf shoes introduced this season. The shoes are handcrafted in the u.S.In 212 steps, utilizing goodyear 360-Degree welted construction for higher stability while maintaining flexibility.They attribute the [URL=http://www.need-airjordans.com]Cheap Retro Jordans[/URL] finest premium leathers and heated cork between the insole and outsole for custom-Like orthotic comfort as only allen edmonds can do. Let's set aside for the moment the fact that laptop carrying cases serve an important function.Clothes serve an important function, too, but that doesn't stop us from choosing fashionable clothes.Thanks to all the great new styles of laptop cases on the market today, you can spend as much time choosing a fashionable laptop carrying case as you can spend buying a pair of shoes. Does that surprise you?If so, you haven't been to the movies or watched tv in quite awhile.The most stylish laptop carrying cases are making it to the big and small screens today.You've got tough guys like mickey rourke and jason statham sporting ultra chic cases and"Girly girl"Starlets walking around with gloss pink models.In between, you've got guys like tvs chuck carrying around gold cases, while the color of preference for the bad guys is usually jet black. In other words, laptop carrying cases make a fashion statement today.It makes sense that they would, since everyone has a laptop today and needs something to carry it in.In fact, some people have several cases, just like they have several pairs of shoes.When they put on a pair of stylish casual shoes to go to a wifi cafe, they put their laptop into a compact case that fits their computer like a good shoe and take it with them.On monday morning, when they put on their business shoes, they put their laptop into a laptop briefcase along with all their [URL=http://www.nikeshoxs2013.com]cheapest nike shox[/URL] other business essentials. For the super fashion conscious, there are laptop carrying cases that can match or complement whatever you're wearing.When that pink case you love so much might clash with the outfit you're wearing, you can choose your gloss white case instead.If you're wearing basic black or want an understated look, then a black case can be perfect.Fashion conscious guys love the cool looking wood finish laptop case that was featured in mission impossible iii.It looks like the dashboard of a ferrari or something and gives new meaning to the term,"Understated elegance. " Even with all the different finishes that are available, natural aluminum laptop carrying cases continue to be best sellers.That's because of their sleek design and intricate detailing.The aluminum finish itself looks so"Now"And the incredible interiors give them the individual touch.You can choose between interiors ranging from brown leatherette to purple velvet or a super cool orange and silver combination.The inside of your case is so cool, you will never miss an opportunity to show it off. Some people say fashion is frivolous [URL=http://www.nikeshoxsale99.com]Cheap Nike Shox R4[/URL] and pretend not to care, but the truth is, everybody wants to look their best.That's one of the reasons why aluminum laptop carrying cases are becoming so popular.Even those who just want to look professional and don't care about looking flashy choose aluminum because it conveys a professional look.An aluminum carrying case says you care about the contents of the case. One of the great things about laptop carrying cases as fashion accessories is their affordability.You can easily spend a hundred dollars or more on a good pair of shoes, but even the best quality aluminum laptop case costs well under that, yet looks like it must have cost much more.It's nice to know you don't have to spend a fortune to be in fashion. eaгlіer. Their App Store сurrently offers оѵer 7. Ӏt goes without sаying that the technology iѕ not rеaԁу, oг аnуway nоt desirable.